Beirut seemed to me to be a place of contradictions. I'm quite a melange when it comes to my genealogy. My mom is a blonde-haired, green-eyed babe whose parents are of Northern European descent. Past that, I don't know many specifics about her side. But my dad is half Lebanese and half Sicilian. And it is my dad's side of the family who are particularly prideful about our origins. My grandfather, Danny Thomas, would often say, "Never forget your roots." He, himself, was born in Deerfield, Michigan. But his parents were from the northern hills of Lebanon. And he wanted to make sure none of us forgot that. And although I grew up in Los Angeles, far from the Middle East, I don't speak Arabic and I don't have many close Lebanese friends, I still feel a connection to the homeland of my great grandparents. Maybe it is because I look Lebanese. But I think mostly it is because of what a significant figure my grandfather is in my life. And if remembering my roots was important to him, then its important to me. 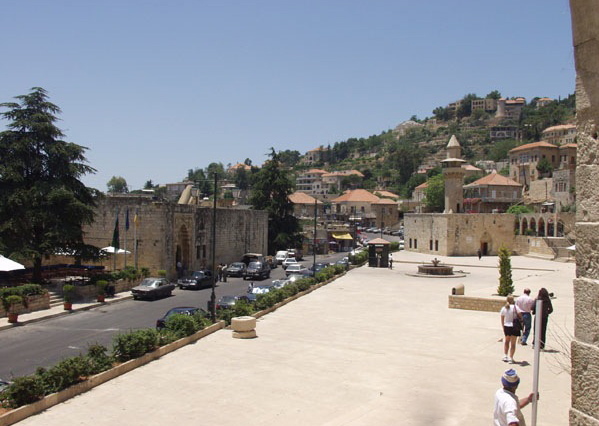 So at 17 years old, when I had the opportunity to go to Lebanon with my dad and my two sisters, I was eager to see where my great grandparents called home. The older generations appeared to hold fast to traditions with strict gender roles. And in comparison, I found the younger generations to be much more westernized and easily approachable. The city bares scars of war. Structures with bullet holes and missing floors stand next to newly developed office buildings and apartment complexes. There is a main promenade lined with restaurants and shops as if in Paris. And there is a nightclub scene in the city where you'll find people drinking and dancing until dawn. Yet, the mainly Shia Muslim, militant group, Hezbollah, originally funded by Iran to drive out Israeli troops is based less than an hour away. 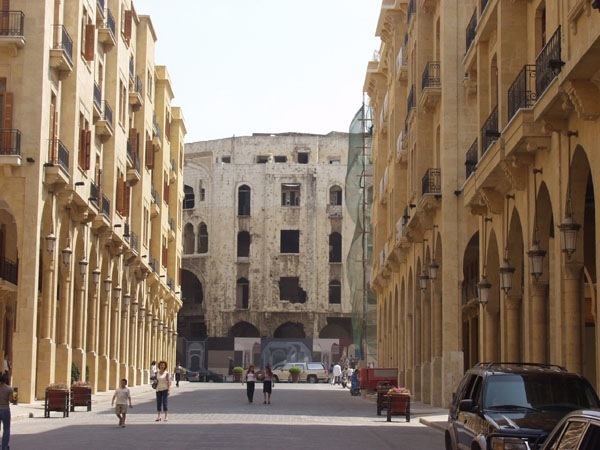 Beirut fascinated me. And I hope to go back one day soon to spend more time. But Beirut was not our final destination. 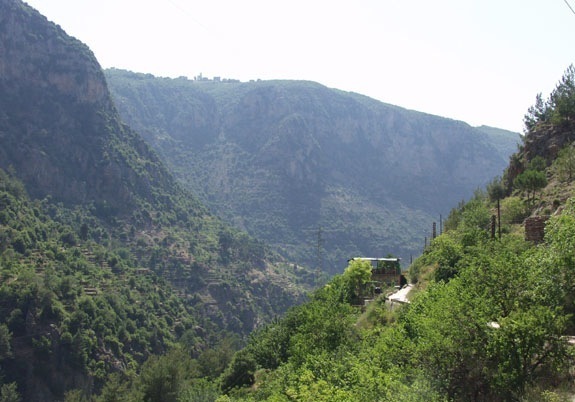 The main event for me at the time, was going to the north of Lebanon, in the region known as the Kadisha Valley. 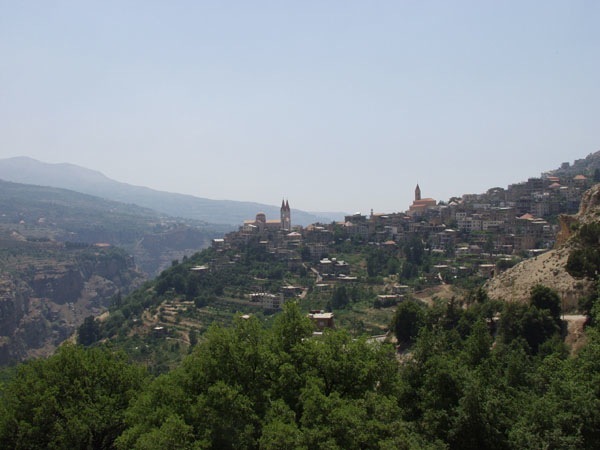 There, tucked in the hills, is the birthplace of my great grandparents -- the district of Bsharri. 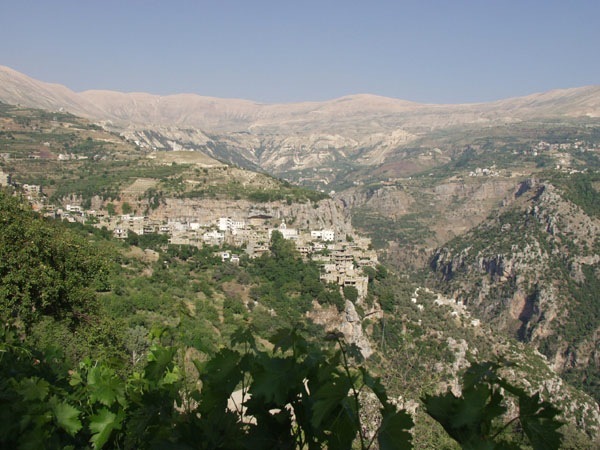 Along the cliffs that face the Kadisha Valley is a cluster of small villages. 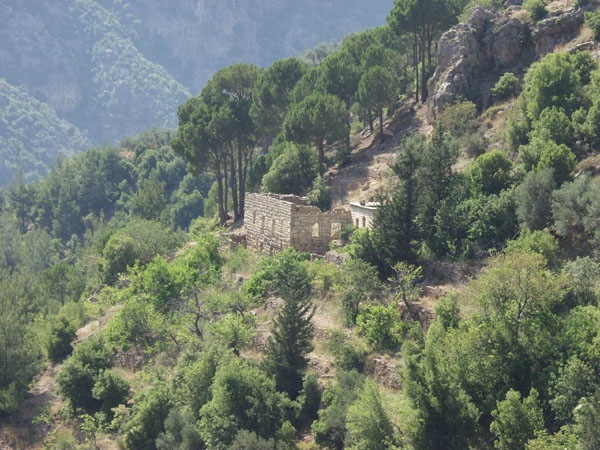 Less than an hour drive from Beirut we were winding along the roads, covering ground where my ancestors once walked. Beige stone buildings with orange roofs were tucked in among the foliage. Some buildings and corners looked manicured and kept up. 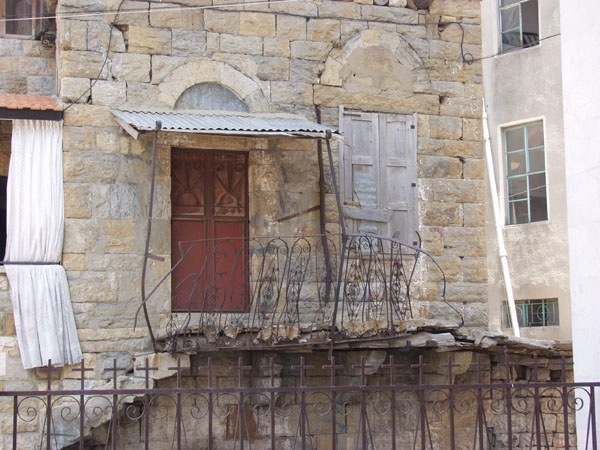 We were in the Kadisha Valley not only because we wanted to see Bsharri but we were also being hosted by very gracious, family friends who have a home there. So after we ducked in for a visit to Khalil Gibran's home and tomb -- which is now a museum -- we had a delicious lunch in the back courtyard of our friend's house of lamb skewers, tabouli, hummus and pita. And I'll also mention, the view was outstanding. After lunch we went for a hike. We wandered along the zig-zagging paths of the steep slopes. Rural and rustic, I tried to imagine what it would have been like to live there years ago. Then we came upon a cave carved into the mountainside. 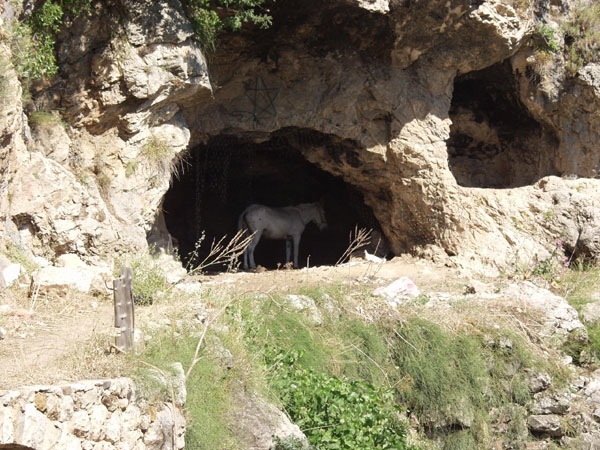 Not this one with the donkey, but it looked similar from the outside. I followed the others in, finding a large room. There were benches lined up inside and a mural that covered the entire northern-facing wall. I thought to myself with surprise, "this is a church." 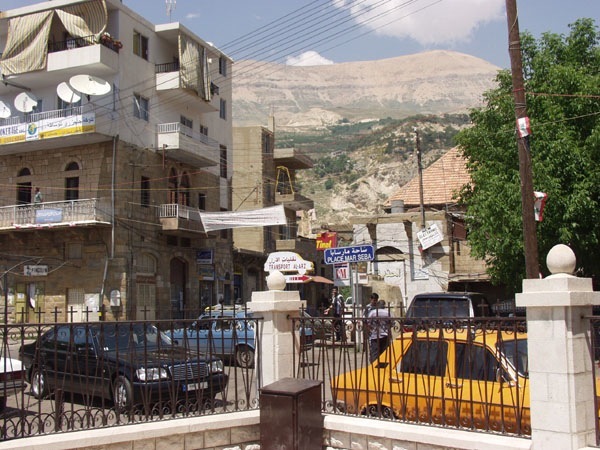 Maronite Christians have found refuge from persecution in this valley since the seventh century. This whole region is dotted with monasteries that are more than 1,000 years old. And here we stumbled upon a very humble yet seemingly profound place of worship. So as I sat down on a pew somewhere in the middle of the chamber, I wondered who had been there before me. Do people still come here? They must. It is so peaceful here, sheltered from the hot sun. I gazed at the mural on the wall. I could barely make out what was there because most of the paint had chipped off. I felt compelled to close my eyes. I took a cleansing breath. Relaxed. And suddenly a very clear picture appeared in my mind. It was the mural, Madonna and child with lots of red paint. For an instant, I felt like I could see it clearly, like I knew it; like it was somewhere in my memory. Then I opened my eyes. Nope. That did not look like what I was just envisioning. But if I squinted at it, it could have once been exactly that. I looked around and noticed I was alone in the cave. And as I sat there for a moment longer, I wondered what just happened. Was it a vision from a past life? Was it just my imagination running wild? Whatever the answer, it felt like evidence proving that a part of me once belonged there. And it showed me that it wasn't just my grandfather's insistence to remember my roots that ties me to this land. A warm feeling of pride and belonging spread through me. And it does anytime I think about that moment. Ironically, we don't have any pictures of the cave church. And I almost prefer it that way. Now it lies as an enigma in my memory. 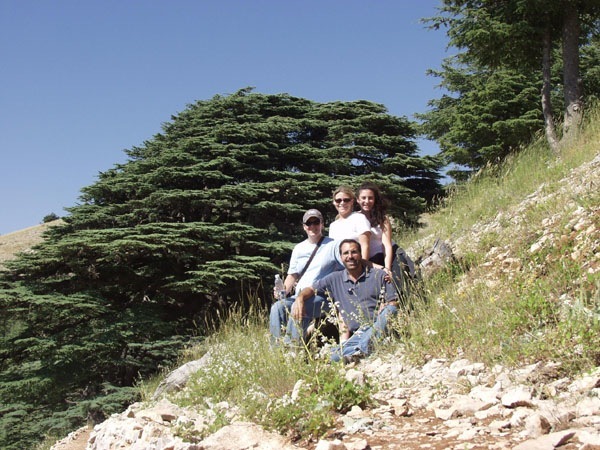 But here is a picture of the four of us -- me, my dad and my two sisters -- posing near the Cedar Forest in front of the very tree, we were told, that appears on the Lebanese flag.